The simplest way to solve this inequation is to use the fact that, for any $A$, $|A|^2=A^2$ (this removes the absolute values), and that function $x^2$ is increasing for non-negative $x$. Thus $$|x+4|\le |2x+10|\iff(x+4)^2\le (2x+10)^2\iff3x^2+32x+84\ge 0.$$ Can you proceed? |𝑥+4|≤|2𝑥+10| <=> (𝑥+4)^2 ≤ (2𝑥+10)^2, as both sides are positive. On the other hand, if 𝑥+4 ≤ 2𝑥+10 it is not necessarily true that it is equivalent to (𝑥+4)^2 ≤ (2𝑥+10)^2, as x+4 and 2x+10 can have any sign. For example, -2 ≤ 1 is not equivalent to 4 ≤ 1. This is the reason that you get different answers, as you are changing the condition you are giving the set of numbers that satisfy the inequality. Not the answer you're looking for? Browse other questions tagged inequality education absolute-value or ask your own question. 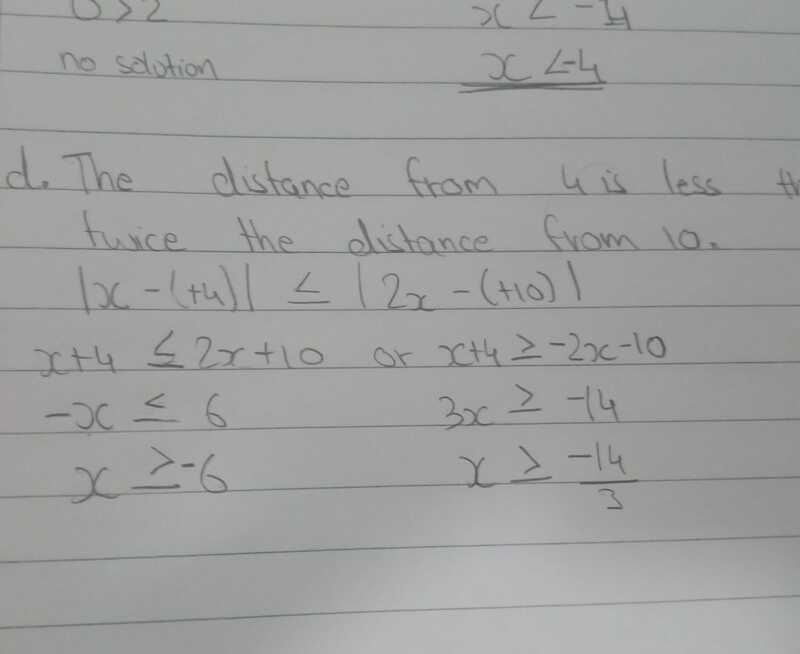 Absolute value quadratic inequalities not the usual?